The view from my bedroom window this morning! 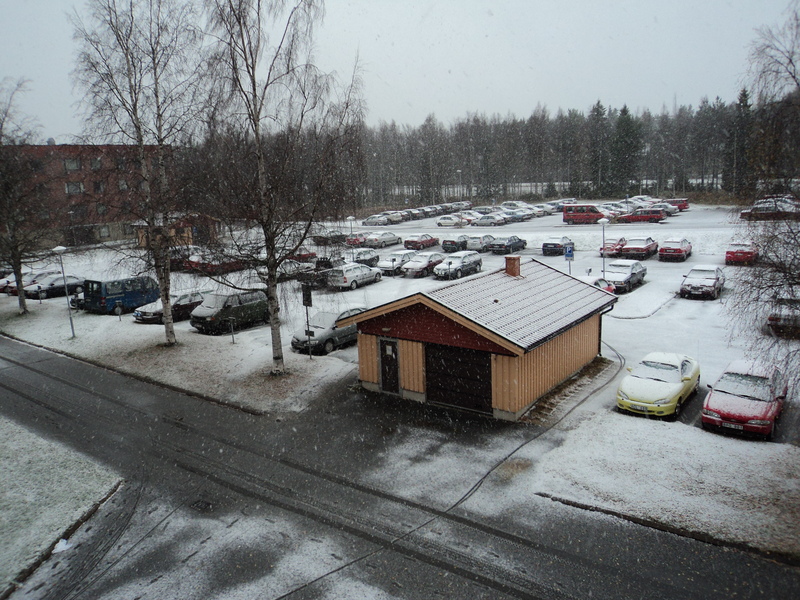 It is October 14, not even the middle of Autumn yet, and it’s snowing! Only in Sweden, folks. Only in the north too, they probably won’t see snow for weeks in Stockholm (which is 1000km south of my cheery little village here). This is early snowfall even for north Sweden, no one expected it! Yesterday was a beautiful sunny day, and I was wearing shorts the day before. In fact, some friends and I had planned a trip to Nordkapp in Norway tomorrow, which is the northern most point in Europe – as far north as one can possibly get by car (and foot for the last little bit). We expected nice weather and clear skies, even hoping to see Aurora Borealis while we were up there…. Then all of a sudden, things changed. I woke up this morning to find my window ajar and thought rain was coming in. I ran to the window and closed it, but noticed that it was not rain at all, but snow! Everything outside was covered, and my mood switched from annoyance to giddy excitement in an instant. That was when I took this photo. The windows to the common kitchen and covered balcony of my dorm were also open this morning, so there was a lot of cleaning to do….. But I was cleaning up snow! SNOW! It was awesome. I’m having snowball fights, catching the falling snow, sliding around in it (it’s so much slipperier than I expected). Oh, and the shoes I bought SPECIFICALLY for the winter? Drenched. So, we’re still going on the trip to Nordkapp, but it will be an entirely different experience now. My friends here are all complaining that the roads will be so slippery, while I sit giggling in anticipation. This entry was posted on October 14, 2010 by stik5. It was filed under Only in..., Sweden . Snow – the memories come flooding back of my first Northern Hemisphere snow experience. Just like you, it was captured out of my dorm window in Colorado. I sat euphoric and mesmerised — soft white powder crystals …. still, soundless, like a balm or tonic. Oddly enough, a wave of serenity and inertia seemed to wash over me. I could have watched it gently falling for hours. This is “real snow” — not like the stuff we experience in the Snowy Mts, Australia. All the locals seemed to have the opposite impression of snow: “Argh this means I’ve got to dig the car out!” “The roads will be slippery,” etc. How could something that bring delight to one, be so disenchanting to another?? Let me know if you see the Aurora Borealis — now that might be life changing! And how about capturing a picture? Enjoy the white stuff; let me know if, or when, you become lulled into a sense of complacency by it. Do you ever think you will say “just another day of snow – ho hum”?